Paul Cézanne ([pɔl seˈzan]; 19 January 1839 – 22 October 1906) was a French artist and Post-Impressionist painter whose work laid the foundations of the transition the 19th century conception of artistic endeavour to a new and radically different world of art in the 20th century. Cézanne can be said to form the bridge between late 19th century Impressionism and the early 20th century\'s new line of artistic enquiry, Cubism. The line attributed to both Matisse and Picasso that Cézanne \"is the father of us all\" cannot be easily dismissed. Pavel Petrovich Chistyakov (Russian: Па́вел Петро́вич Чистяко́в) (July 5 [O.S. June 23] 1832 – November 11, 1919) was a Russian painter and teacher of art. Pavel Petrovich Chistyakov (Russian: Па́вел Петро́вич Чистяко́в) (July 5 [O.S. 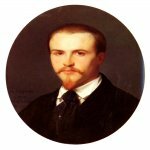 June 23] 1832 – November 11, 1919) was a Russian painter and teacher of art. The main goal of Chistyakov was the preparation of the artist-citizen possessing high professional skill. His pedagogical method assumed the merger of the direct perception of nature by the artist with its scientific study. In creative practice he aspired to dramatization of a historical plot and psychological saturation in historical and genre portraits. Carlo Crivelli (Italian, c. 1435 – c. 1495) was an Italian Renaissance painter of conservative Late Gothic decorative sensibility, who spent his career mostly in the Marche, he absorbed early influences from the Vivarini, Squarcione and Mantegna into a distinctive personal style that makes a contrast to his Venetian contemporary Giovanni Bellini. Vittorio (or Vittore) Crivelli was an Italian painter, brother of Carlo Crivelli. Born ca. 1440 in Venice, dead in Venice 1501 or 1502. His works are similar in style to his brother\'s, but less accomplished. There are examples of his work in the Metropolitan Museum of Art in New York, the Pinacoteca Brera in Milan, the Ashmolean Museum, Oxford, the Fitzwilliam Museum, Cambridge, and the Philadelphia Museum of Art. Lorenzo Costa (1460 – March 5, 1535) was an Italian painter of the Renaissance. He was born at Ferrara, but moved to Bologna by the his early twenties, and would be more influential to the Bolognese school of painting. However, many artists worked in both nearby cities, and thus others consider him a product of the School of Ferrara. There are claims that he trained with Cosimo Tura. Michelangelo Merisi da Caravaggio, (29 September 1571 – 18 July 1610) was an Italian artist active in Rome, Naples, Malta and Sicily between 1593 and 1610. His intensely emotional realism and dramatic use of lighting had a formative influence on the Baroque school of painting. Famous (and notorious) while he lived, Caravaggio was forgotten almost immediately after his death, and it was only in the 20th century that his importance to the development of Western art was rediscovered. Despite this, his influence on the new Baroque style that eventually emerged the ruins of Mannerism, was profound. Lodovico Cardi, also known as Cigoli (1559 – 1613), was an Italian painter and architect of the late Mannerist and early Baroque period, trained and active in his early career in Florence, and spending the last nine years of his life in Rome. An artist of considerable intellectual accomplishment and a friend of Galileo, Cigoli was the key artist in Florence in the late sixteenth century. Like his contemporaries, Ludovico and Annibale Carracci in Bologna and Caravaggio in Rome, he rebelled against the Mannerist style, emphasizing the study of nature together with the work of the masters of the High Renaissance. (born 1436, Ferrara, Duchy of Ferrara; died 1478, Bologna, Emilia) early Renaissance painter of the Ferrarese school who, through his seven years’ residence in Bologna, exercised a profound influence on the course of Bolognese painting. Cossa’s style is characterized by stiff, heavy drapery folds and a sharply linear rendering of complex surfaces. Jean Désiré Gustave Courbet (10 June 1819–31 December 1877) was a French painter who led the Realist movement in 19th-century French painting. The Honourable John Maler Collier OBE RP ROI (27 January 1850 – 11 April 1934), called \'Jack\' by his family and friends, was a leading English artist, and an author. He painted in the Pre-Raphaelite style, and was one of the most prominent portrait painters of his generation. Both his marriages were to daughters of Thomas Henry Huxley. He studied painting at the Munich Academy where he enrolled on 14 April 1875 (Register: 3145) at the age of 25.